The across the board relentless deterioration in the quality of NHS healthcare is not just limited to adult services but as illustrated by the Sheffield Children's Hospital Accident and Emergency Walk-in facilities is literally an across the board manifestation of healthcare paralysis for reasons that go beyond the usual tendency for the public sector to be inefficient. The case of the Spanish nurse contracting Ebola from a Spanish patient flown into Spain from West Africa and going onto infect others as patient zero for the outbreak with more than 50 being monitored, illustrates the myth of competency that surrounds the western public sector health services in that at least for 1/3rd of the time the public health services only tend to go through the motions of providing a health service which whilst most of the time the consequences for lack of consistency in competency is only to the detriment of the patient, however Ebola is completely unforgiving where any lack of competency can result in a disastrous outcome as Spain is realising today that there is a huge gap between what it's health service states it can do and what it actually delivers. To be blunt, NHS GP's are increasingly NOT doing their jobs, ignoring patient symptoms, fail to refer even misleading patients that a referral has been made, forcing patients to pay for routine referrals with the icing on the cake of obnoxious reception staff who see their jobs as doing their up most at hindering patients in pursuit of competent healthcare. This is the message from the latest GMC report that concludes that patient complaints have soared by 23% during 2011, that is resulting in patients increasingly being forced to pay to see competent private GP's therefore in effect patients are being forced to pay twice for healthcare, once through high extortionate taxes to fund the life-styles of increasingly part-time NHS GP's (3day surgery consultation weeks) and then again for actual diagnoses and referral. The Royal College of Physicians reports that NHS Hospitals are in a state of collapse and patients are suffering as doctors play pass the parcel with patients between wards due to lack of operational beds despite a record amount of over £130 billion extorted from tax payers annually to fund the NHS black hole. The RCP blames the crisis on a drop in the number of beds whilst demand has risen, this despite the fact that the NHS budget has more than tripled over the past 15 years as my earlier analysis illustrated . Mainstream press commentary gives the impression that there is a battle taking place between GP's who are either for or against the Coalition Government reforms for the transference of annual NHS commissioning budget of at least £80 billion into the hands of GP led consortia's across the country. One Medicare (owned by One Medical) with much fanfare and glossy leaflet drops opened Sheffield's GP Polyclinic or Super Surgery in April 2009 that offered 7 days per week access from 8am to 8pm, situated near the centre of Sheffield, located on the corner of Rockingham Street and Broad Lane. The centre allows any person to walk in off the street and see a GP or nurse without a prior appointment (allow approx 2hr waiting time) and those choosing to register with the surgery receive full NHS services, thus offering the potential for those stuck in Sheffield's worst ranking GP Surgeries to register with a better ranking and resourced GP surgery. The long dreaded swine flu epidemic is starting to sweep across Britain resulting in NHS critical care hospital beds filling up and some 40 deaths to date of which 36 are as a consequence of H1N1 Swine Flu. The coalition government had cut Labours Swine flu prevention advertising campaign as well as other measures that were directly aimed at preventing a swine flu epidemic. NAO writes: Hospital productivity has fallen over the last ten years, according to the National Audit Office. Over the period since the ‘NHS Plan’ in 2000 there have been significant increases in hospital funding, to deliver improvements in the patient care, and designed in part to increase productivity. Hospitals have used their increased resources to deliver against national priorities, but they need to provide more leadership, management and clinical engagement to optimise the use of additional resources and deliver value for money. An international study of 2.4 million people published in the Lancet has revealed that Britain lags far behind most other western countries in terms of cancer survival rates for Breast, Bowel Ovarian and lung cancers with the blame being firmly placed on delayed / late diagnoses by NHS GP's. The Men's Health Forum, a charity aimed at targeting the inequalities in NHS delivery that results in 1/5th of men dieing before they reach the age of 65 as against 13% of women, has launched a campaign called "Lives to Short" to highlight the discrimination in the delivery of UK health services that effectively puts off men from seeking help due to their natural tendency towards reluctance to make a fuss. The coalition government announcement of spending cuts was crippled from the outset as a consequence of ring fencing the biggest spending departments whilst the mainstream media obsessed over 30% cuts to far smaller departments, the consequences of which are that total UK government spending will NOT fall for ANY year. Predrag Rajsic writes: Canadian emergency rooms are infamous for their long wait times. A recent study has shown that in most of them the average wait time exceeds 6 hours and sometimes reaches up to 23 hours. While some call for action in reducing these extremely high figures by increasing the supply of healthcare services, others try to present the situation as, in principle, an unavoidable fact of life. The 13 year Labour government has come and gone and still PCT's such as the Sheffield NHS are sat twiddling their thumbs with yet another patient consultation rather than acting to allow patients to be able to choose to register with any GP, as patients remain locked into their local GP surgeries regardless of the huge disparity in actual health care provision as experienced by patients and as demonstrated by the UK GP Patient survey ( http://results.gp-patient.co.uk- table below). The New UK ConDem government has scrapped Old Labours efforts to hold GP's and the NHS Hospitals to account by means of feeble waiting time targets such as of being able to see ones GP within 48 hours, or be assessed at your local hospital within 4 hours. I say feeble because GP's have long since developed tricks, simple mechanisms to avoid falling fowl of Labours targets such as not picking up the phone on patients calling to make appointments, or telling patients to come in on a later date to make an appointment. Nearly 6 million UK GP patients are being given the chance during 2009 to rate their GP services in terms of quality of access and service by the Department of Health funded GP Patient Survey conducted by Ipsos MORI. The Labour government despite tripling the NHS budget / GP Pay over the past 10 years has resulted in a continuous fall in productivity over the past 6 years or so, has finally announced a proposal to implement a policy that I have long concluded as one of the two key critical reforms necessary to drag the NHS into the 21st century with a view to putting the patient first for the first time since its creation. The heated healthcare debate across the atlantic last week that targeted the NHS as a bureaucratic nightmare when it comes to actual delivery of prompt and efficient healthcare has started to reveal cracks in the Tory party public position on the NHS as Tory MEP's and MP's are rebuked by David Cameron for breaking with Tory front bench policy of continuing expansion of funding for the NHS regardless of the state of the country's finances so as to maximise votes amongst the 1-2 million voters that are either directly or indirectly employed by the NHS. Over the past 9 months many if not most GP surgeries have made it increasingly difficult for patients to make appointments to see their GP's. Patients seeking GP appointments since September 2008 have invariably been met with the response by GP surgery reception staff to go home and someone will call you. On going home invariably the phone call results with the patient being told to go to their local hospitals walk in centre if the symptoms deteriorate. NHS trust hospitals are providing British NHS patients with third world patient health care whilst at the same time tax payers have tripled the NHS annual budget under the Labour government. This lack of competent health care has been brought home in a report by the Healthcare Commissions as reported by The Times. Patients that have spent there whole lives working and contributing towards NHS budgets so that others can benefit from free healthcare are now being hit in their late life illness with a not so NICE death sentence as the NHS focuses resources towards those with self inflicted illness such as alcohol, tobacco and drugs abuse. 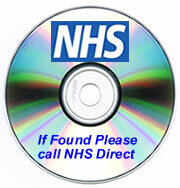 The government announced today an initiative that would remove licenses from incompetent GP's. In recognition of the size of the problem of incompetent doctors practicing in GP surgeries across Britain which has lead to a loss of confidence by patients in the rigid NHS GP system that treats patients virtually as ATM cards to swipe in and out of surgeries has resulted in hundreds of thousands of patients abandoning the NHS in favour of private competent diagnoses services such as those offered by BUPA. Many more patients have given up altogether on visiting their GP's after being repeatedly met by literally worthless shoulder shrug diagnoses. The NHS celebrates its 60th birthday today. The government has been marking the landmark event through a string of announcements of initiatives aimed at bringing the ageing and bureaucratic institution into the 21st century. Following New Labour's 1997 victory the cry went out for more spending on the NHS in real-terms. i.e. above the rate of inflation as the NHS had been under funded for the duration of the preceding Conservative government. Labour more than fulfilled this election pledge by delivering a whopping £300 billion (est.) of extra real terms spending, as an example of the magnitude of the increase, £300 billion is more than the amount the government has earned from North Sea Oil and Gas since 1997 and has resulted in the NHS expansion from approx 4.8% of the UK's Gross Domestic Product (GDP) to 8% of GDP and is destined to continue to grow under New Labour towards a target of 11% of GDP by 2020. In an attempt to halt the governments programme for the implementation of Polyclinics or ‘Super Surgeries', the political arm of GP's the British Medical Association (BMA) delivered a petition of more than 1 million signatures to Downing Street against the implementation of 150 ‘Super Surgeries' and for existing GP Surgeries to be protected. The Health Minister, Ben Bradshaw lashed out at the scare tactics accusing the BMA of "misleading and mendacious" behaviour in getting patients to sign up to the petition. In an attempt to provide competent GP healthcare services, the government is planning to proceed with the first phase of the creation of 150 super surgeries across Britain. Currently the NHS and GP Surgeries discriminate against men and those living within deprived wards, which comprises more than 60% of the UK population. Therefore barely 40% of the UK population is receiving competent GP surgery services and NHS hospital healthcare. This despite a tripling in the NHS budget which is increasingly seen by the voters as money wasted. Panorama: How Safe Is Your Hospital? BBC One 's Panorama reveals that there are 10 times more deaths across the UK from the superbug clostridium difficile among over 65-year-olds than in any other country in the world. The Governments top cancer expert warned that GP's are failing to diagnose cancer symptoms in an interview with the Observer. Health Secretary Alan Johnson is writing to every GP in England requesting that they change their working hours to meet patient care demands. The response from GP's doing the rounds on the breakfast TV is to demand more money. More money on top of the tripling in salaries under New Labour. 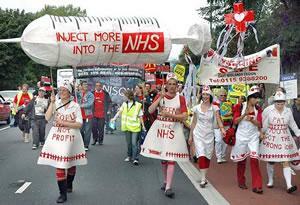 Virtually all GP's are paid well in excess of £100,000 and many in excess of £200,000 per annum. Whilst at the same time GP's have cut their working hours as the NHS primary trusts fly in doctors from mainland Europe to cover for out of hours care for the majority of GP surgeries. 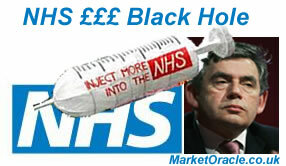 Gordon Browns big new idea for the NHS for 2008 is for patients to apparently diagnose and treat themselves. This is being packaged up in the form of a constitution for the NHS but the aim is that after having failed to meet the nations health needs despite a tripling in the annual NHS budget. The goal now is to reduce patients reliance on the NHS with patients having to increasingly pay for treatment privately. A shocking report by the research group "Breakthrough Breast Cancer" reveals that as many as a third of GP's are failing to refer patients with suspected breast cancer as urgent cases. Which is one of the core reasons why Britain lags behind most of Europe in terms of cancer deaths. Even behind many poorer eastern european countries that spend less than 1/3rd the amount the UK spends on the National health Service.GP's failure to properly understand the procedures for urgent referral of suspected breast cancer cases costs thousands of lives every year. The NHS delivered fraudsters a potentially early Christmas present by nine NHS trusts losing the computerised records of hundreds of thousands of patients across England, as data disks went missing. Its a case of here we go again..
Gerry Robinson the management guru returns to see if his management reforms implemented a a year ago at a large district hospital in the North of England have taken root and managed to fix the NHS. Patients continue to lose confidence in the wake of lack of competency in the NHS ability to manage resources resulting in little more than 30p of output for every extra £1 spent on the NHS. Your NHS surgery is manned by smooth talking incompetent GP's who do not know the difference between flu symptoms and something far worse that can literally kill within weeks. The NHS Hospitals and GP surgeries routinely discriminate against patients, the degree of discrimination varies but the end result is if you are a vocal white middle class non smoker then you will generally receive the best the NHS has to offer. On the other hand, if you are non-white, poor, disabled, obese, or a smoker then you will be discriminated against. So the politicians cry of free healthcare only applies to some and not to many ! Rob Mackrill writes : When doctors in Israel took industrial action and went on strike back in 2000, it highlighted a strange phenomenon – when doctors go on strike, the death rate plummets. In this particular instance, the death rate fell by nearly 40% over the strike period. But it's by no means an isolated example. A near tripling in GP salaries since New Labour came to office has led to less time spent in practice by GP's, as they seek to enjoy their windfall payout's on the golf green rather than spend time in surgeries. This means less time committed to patient consultations and thus quality of GP diagnoses is expected to decline significantly.